WW1 Reenactments Equipment : Great War Tommy WW1 Food Rations Labels : Australian Meat Paste can label. WW1 Reproductions and WW1 Reenactors Equipment / Kit - Australian Meat Paste can label. 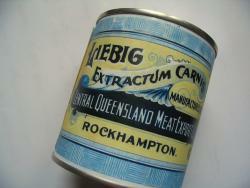 Liebig's extract of meat label, produced by the Central Queensland Meat Export Co, of Rockhampton who also produced Corned Beef. Liebig's 'Extractum Carnis' was an early form of concentrated food. Label fits condensed milk sized cans.